Legend and Lace for Karen Kay Buckley products in Australia - Karen Kay Buckley Perfect Scissors 7 1/2"
This special blade pulls the fabric into the scissors rather than pushing it away like traditional scissors. Things you will like about these scissors...cushioned handle, easy for right or left hander to use, blades sharp to the very tip, serrated blade keeps fabric from fraying, light weight and comfortable. The 7 1/2" size are great for cutting single or multiple layers of fabric. I can comfortably cut up to 4 layers. 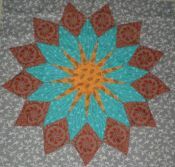 If your quilt has a lot of one shape, layer cutting saves a tremendous amount of time.